The following outlines the requirements for completion of Module 4 in The certificate in The Social Psychology of Risk (by online learning). 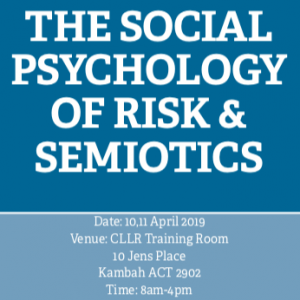 This Module investigates the intersection between leadership theory and the social psychology of risk. It explores the development of leadership theory in relationship to human judgment and decision making and organisational concerns about risk. The challenges of risk to leadership and learning, and current trends in risk aversion will be examined particularly with regard to the follower-leader dynamic. One of the greatest challenge to leaders and organisations is the management of uncertainty, unexpectedness and the interaction with followers. The nature of the follower-leading dynamic and the engagement space between the leader and follower is a primary focus of this unit. The management of fallible humans through the modern excesses of complex systems will be examined with regard to important social psychological concepts such as: bounded rationality, risk homeostasis, cognitive bias, attribution, heuristics, counter-intuition, the authoritarian personality, indoctrination, propaganda, bystander effect, cognitive dissonance, motivation and social perception. The study of social psychological principles and concepts enables a new way of understanding why people do what they do, especially understanding how people make sense of risk. This is the foundation of effective leadership. Participants will have to include in their Journal responses to Workshop Questions from the book for Chapters 1, 2, 3, 4. You are expected to keep a journal (A4 if possible) of reflections on leadership particularly in relationship to reading the book and making three visits on a semiotic walk. You must visit: a charity organization, large shopping complex eg. IKEA or Apple store and, a church/cathedral (preferably Catholic). Your journal is a thinking, documenting, reflecting book where you use the visual and spacial literacy tools provided in previous units (and experience from the unit on Semiotics) to interrogate space and place and how these relate to following-leading. The key questions for thinking are on the visual and spacial literacy tool. Your journal can include: photos, floor diagrams, concept mapping, sketches, dot points, flyers, pictures, notes, Venn diagrams, images of semiotics, concept maps, doodles, notes on words, slogans and text or any form of input that helps show how you think and reflect on what you saw. The purpose of the journal is for you to demonstrate your skill in interrogating place and place and how this defines following-leading. A discussion group is soon to be set up, for the moment we will just use group email. You will be informed of others studying this module with you. Responses to Workshop questions at the end of Chapters 1,2,3,4 from Following Leading in Risk, A Humanising Dynamic. Once you have registered for the Module you will be invited to a shared Dropbox group where resources and readings will be available. Haslam, S., et. Al., (2011) The New Psychology of Leadership, Identity Influence and Power. Psychology Press. New York. Kellerman, B., (2008) Followership, How Followers Are Creating Change and Changing Leaders. Harvard Business Press, Boston. 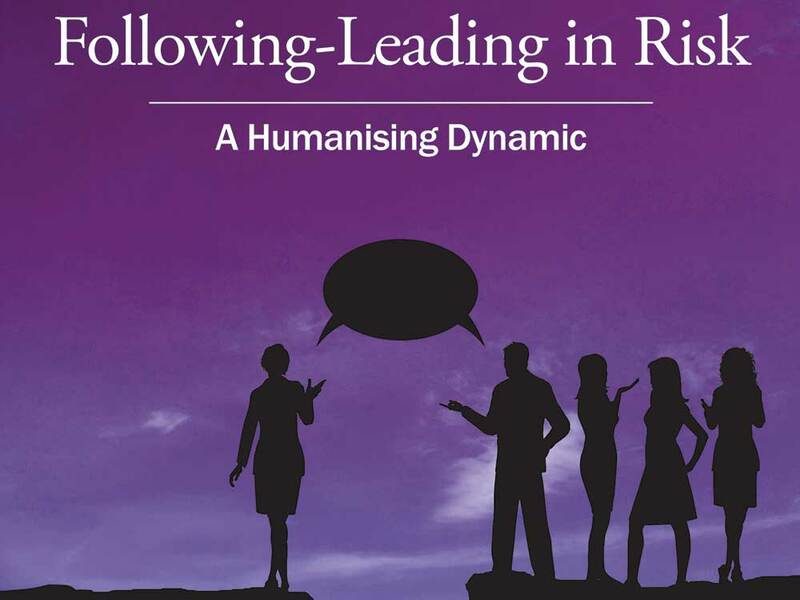 Long, R., (2014) Following-Leading in Risk, A Humanising Dynamic. Scotoma Press, Canberra. Caldini, R., (2011) Influence, Science and Practice. Peason, Boston. Riggio, R., Chaleff, I., and Lipman Blumen, J., (eds) (2008) The Art of Followership. Jossey-Bass, SanFrancisco. Sinclair, A., (2007) Leadership for the Disillusioned. Allen and Unwin, Crows Nest. Adorno, T. W. et. al. (1969) The Authoritarian Personality. Norton, New York. Altemeyer, B. Enemies of Freedom: Understanding Right-Wing Authoritarianism San Francisco, Jossey-Bass, 1988. Ariely, D., (2008) Predictably Irrational, The Hidden Forces that Shape our Decisions. HarperCollins, Melbourne. Axelrod, R., and Cohen, M., (2000) Harnessing Complexity. Basic Books, New York. Bargh, J. A., (ed.) (2007) Social Psychology and the Unconscious: The Automaticity of Higher Mental Processes. Psychology Press, New York. Brown, V., Harris, J., and Russell, J., (2010) Tackling Wicked Problems Through Transdisciplinary Imagination. Earthscan, London. Chopra, D., 2010) The Soul of Leadership. Rider, London. Conklin, J., (2006) Dialogue Mapping: Building Shared Understanding of Wicked Problems. Wiley, London. Deci, E., (1995) Why we do What we Do, Understanding Self Motivation. Penguin Books, New York. Evans, D., (2012) Risk Intelligence, How to Live with Uncertainty. Free Press. New York. Fairclough, N., (2013) Discourse and Social Change. Polity Press, Cambridge. Gardner, H., (1993) Frames of Mind, The Theory of Multiple Intelligences. Fontana, London. Gladwell, M., (2008) Outliers, The Story of Success. Penguin. London. Gladwell, M., (2013) David and Goliath, Underdogs, Misfits, and The Art of Battling Giants. Penguin. London. Hackman, R., (2002) Leading Teams, Setting the Stage for Great Performances. Harvard, Boston. Hoffer, E,. (2002) The True Believer. HarperPerennial, New York. Hook, S., (2005) The Hero in History. Cosimo Classics, New York. Isaacson, W., (2012) Steve Jobs. Simon and Schuster, New York. Jung, C., (1964) Man and His Symbols. Dell, New York. Kahney, L., (2004) The Cult of Mac. No Starch Press, Singapore. Keen, A., (2007) The Cult of the Amateur. Random House, New York. Keen, A., (2012) #digitalvertigo, how today’s revolution is dividing, diminishing and disorienting us. St Martin’s Griffin, New York. Klein, G., (2003) The Power of Intuition. Doubleday, New York. Linden, R., 2010) Leading Across Boundaries, Creating Collaborative Agencies in a Networked World. Wiley, New York. Meissner, W. W., (1971) The Assault on Authority Orbis Books, Maryknoll. Mintzberg, H., Ahlstrand, B., and Lampel, J., (1998) Strategy Safari, The Complete Guide through the Wilds of Strategic Management. Prentice Hall, New York. Mintzberg, H., (2005) Managers not MBAs. Berrett-Koehler, San Francisco. Negri, A., (2005) The Politics of Subversion: A Manifesto for the Twenty-First Century. Polity Press, Cambridge. Pike, D., (1967) Paradise of Dissent; South Australia 1829-1857. Melbourne University Press, Melbourne. Ramachandran, V.S., (2004) A Brief Tour of Human Consciousness. Pi Press, New York. Rank, O., (1914) The Myth and the Birth of the Hero, A Psychological Interpretation of Mythology. Journal of Nervous and Mental Disease Publishing Company, New York. Robinson, K., (2009) The Element, How finding your passion changes everything. Penguin, London. Ruggeriero, V., (2003) Beyong Feelings, A guide to Critical Thinking. McGraw Hill, Boston. Schein, E., (2010) 4th Edition. Organisational Culture and Leadership. Jossey Bass, San Francisco. Smith, E., (2012) Luck, What I Means and Why it Matters. Bloomsbury, London. Standards Australia (2009) AS/NZS 31000:2009 Risk Management – Principles and Guidelines. Standards Australia. (2010) Handbook 327: 2010 Communicating and Consulting about Risk. Stone, W., Lederer, G. and Christie, R. (eds.) (1993) Strength and Weakness:The Authoritarian Personality Today Springer-Verlag, New York. Tannen, D., (1998) The Argument Culture, Moving from Debate to Dialogue. Random House, New York. Tannen, D., (1998) Conversational Style, Analysing Talk Among Friends. Oxford, London. Vol. 8, No. 3, September 2005, pp. 205–217. Weick, K., (1979) The Social Psychology of Organizing. McGraw Hill, New York. Young, J., and Simon, W., (2005) iCon, The Greatest Second Act in the History of Business. Wiley, New York. Zinn, J., (ed) (2008) Social Theories of Risk and Uncertainty, An Introduction. Blackwell, London.